The following is our selection of the best events in Dublin in 2019. There are, of course many other events in the entertainment, sport and literary scene in Dublin, If any organiser of any event wants to have their event listed here , please let us know at info@dublinovernight.com. Screening of international films especially films from countries that were part of the the Silk Road ancient trade routes. Includes Asian, Arab, Middle Eastern, African, Mediterranean and European cinema. This is the Year of the Pig which will be welcomed with a programme including talks, visual arts, performance, film, music and numerous events for all ages. Chinese culture on the streets of Dublin. The Cripple of Inishmaan by Martin McDonagh is set on Inishmaan (Inis Meáin), off the West Coast of Ireland in 1934. ‘Cripple’ Billy Claven, eager to escape Inishmaan, tries for a part in a Hollywood film being shot on Inis Mór and to everyone’s surprise, he gets his chance… or does he? This the 8th showing of music & comedy show The Night Joe Dolan’s Car Broke Down at The Olympia, where it has been attended by over 60,000 so far. This concert is part of his ‘60 Years of Music’ World Tour and will feature Portuguese fado legend Dulce Pontes as a special guest singer. A feast of Irish and International films on screen as well as talks, masterclasses and lots of other events. Southern Kings from South Africa will pose a significant threat to Leinster because the game taking place in the middle of the Six Nations Championship and with many of Leinster’s internationals with the Irish squad, some of Leinster’s younger players will get a chance to shine. A new stage adaptation of Edna O’Briens novel which was banned in Ireland in the 1960s as “indecent and obscene” but went on to become a best seller. Lucy Kirkwood’s darkly funny play, The Children, in which three retired nuclear scientists are forced to question their responsibility towards future generations explores the themes of ageing, personal responsibility, and climate change. The Royal Moscow Ballet makes a return visit to The Helix on March 2nd 2019 with its production of Tchaikovsky’s Swan Lake. The combination of drama and tragedy, good and evil makes Swan Lake an evergreen favourite. Europe’s biggest country music festival is at 3Arena for its sixth with another great lineup of country stars including international superstar Keith Urban, Chris Stapleton, Lady Antebellum, Hunter Hayes, Ashley McBryde, Drake White & The Big Fire, Brett Eldredge, Chase Rice, Dustin Lynch, Carly Pearce and Lyle Lovett. Aslan is celebrating 25 years since the release of the album Goodbye Charlie Moonhead and the will be playing songs from the album including Crazy World, Rainman, Where’s the Sun, Games, Sweet Time and Goodbye Charlie Moonhead and many of their other favourites. This annual festival gets bigger and more colourful every year with music, theatre, exhibitions, marching bands and general gaeity ending in the legendary parade through Dublin’s streets. Irish soprano Celine Byrne joins a multitude of Irish and international in Madame Butterfly in Puccini’s most famous opera with the RTÉ Concert Orchestra. This will be Mick McCarthy’s first competitive home game since taking over from Martin O’Neill. Will his second spell as manager be better than the first? The Glass Menagerie by is a memory play by Tennessee Williams. The plot is drawn from the memories of Tom Wingfield, an aspiring poet who works in a shoe warehouse to support his mother and sister. A live broadcast shown on the big screen of the Royal Opera performance of this well known opera by Gounod performed by a cast of great international singers and the Royal Opera Chorus. The Magic Flute, by Mozart, performed by Irish National Opera with the Irish Chamber Orchestra. A new adaptation of Henry James’ famous novel is described as “a masterclass in stage-craft, with captivating performances, deliciously atmospheric set and lighting design and an evocative soundtrack”. A celebration of James Joyce, especially his novel ‘Ulysses’ set in one day 16th June 1904 in Dublin. Readings, theatre, walking tours, lectures, dissertations, and dressing up in the fashion of the time. Taste of Dublin has become an annual event at the Iveagh Gardens and is a favourite destination of foodies from all around the country and abroad. Many of Dublins best restaurants get together to prooduce signature dishes and tastes and some great chefs give cookery classes and demonstrations. Food, beer and wine tasting with lots of live music. This may be your last opportunity to see Elton John live as he states that this Three-Year Final Farewell Yellow Brick Road tour will be his last before he closes that chapter of his life. Parades, theatre, music, cookery, cinema, talks and lots more in this festival which is celebrating 40 years of fight back by the LGBTQ community. Over 300 Spectacular Show & Activities including the best in international street performers, street artists, family activities, tasty street food and a pet area. Dún Laoghaire will be the centre of great boat racing in all classes with lots of entertainment for everybody. The Dublin Horse Show features the best show horses and the best international show jumpers. It is one of Ireland’s biggest sporting events which attracts tens of thousands of people annually from home and abroad. See http://dublinhorseshow.com for programme, visitor information and tickets. Dublin Fringe Festival is home to bold ideas, brave performing arts in theatre, music, comedy, dance and much more. Dublin Theatre Festival is Europe’s oldest theatre festival, bringing world-class theatre to Dublinand showcasing the best of Irish theatre to the world. 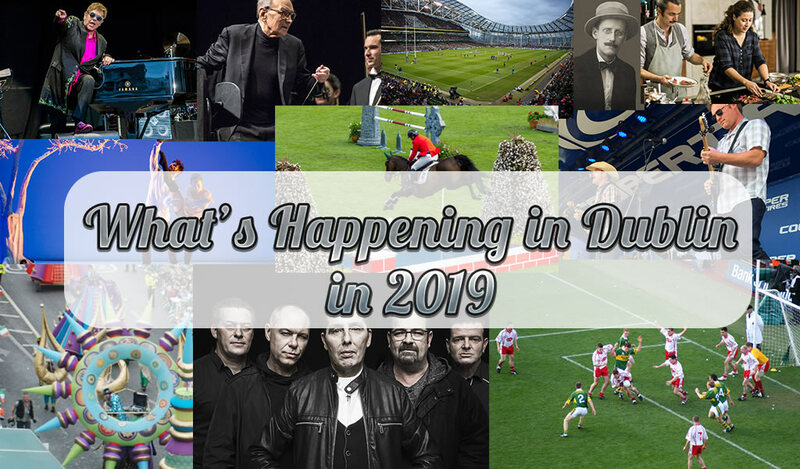 We will be adding to this list of events in Dublin in 2019 throughout the year. If you want to know whats on in Dublin check back here.